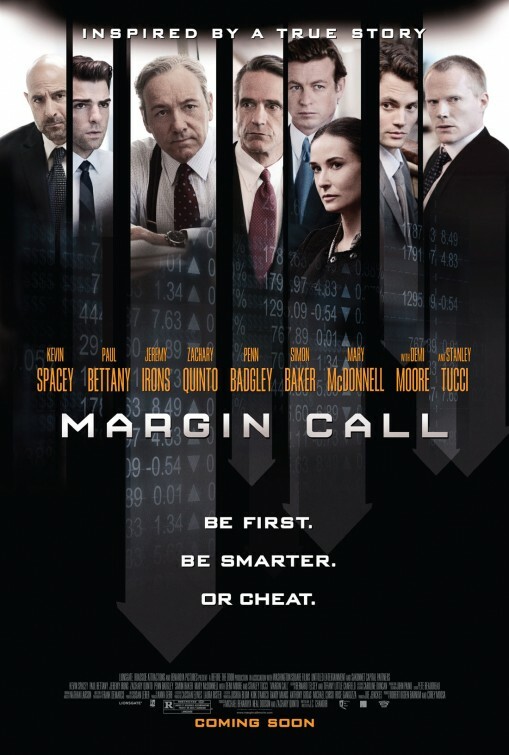 Set during the first twenty-four hours of the 2008 economic meltdown, Margin Call feels like David Mamet’s classic play Glengarry Glen Ross just set fifty floors higher. It’s a tense stew of ego and hubris and cunning and manipulation and self-preservation, peppered with some salty language. The corporate bigwigs of a fictional financial firm scramble to get out the door first before everyone else catches on to the looming market crash. “There are three ways to make a living in this business: be first, be smarter, or cheat,” says the CEO (Jeremy Irons). Debut writer/director J.C. Chandor brilliantly captures the rationalization of sociopathic greed; the CEO waxes about the historical inevitability of our own self-destructive influences, glibly recounting other market crashes and saying he will survive because the nation’s class systems are fixed. The behind-the-scenes scheming has a sick appeal, witnessing how Wall Street wriggled free of responsibility. This isn’t a far-reaching look into the financial meltdown; it’s more of an insular, thoughtful, occasionally meditative play about the moral questions at play. The prosaic pacing caused quite a slew of yawns in my audience. There does seem to be a never-ending cascade of scenes where two characters will just sit and talk. However, when the writing is this sharp and the actors are all at the top of their game (Kevin Spacey is emotionally spent in a test of loyalties; Irons is charmingly sleazy), then you can forgive some stagnate pacing. Margin Call has a few heavy-handed metaphors (Spacey putting his dog down = the economy! ), but overall it’s astute, insightful, sophisticated, and compelling enough to forgive its overreaches. Posted on October 27, 2011, in 2011 Movies and tagged demi moore, drama, indie, j.c. chandor, jeremy irons, kevin spacey, paul bettany, stanley tucci, wall street, zachary quinto. Bookmark the permalink. Leave a comment.